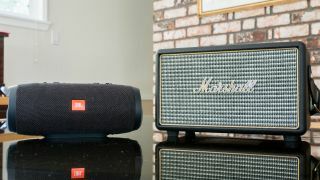 Here at TechRadar, our favorite Bluetooth speakers are the ones that both last a long time and can get loud enough to reveal all the details of our music. The Marshall Kilburn does both. You can't go wrong buying a speaker from a renowned manufacturer like Marshall, after all. If that wasn't enough to sell you on it, Amazon is slashing the price by 50% for its 12 days of deals promotion. That means you can get this beefy Bluetooth speaker for just $149! That's a great deal if we've ever seen one. At 9.5 x 5.5 x 5.5 inches and over 6 pounds, the Marshall Kilburn is one big bluetooth speaker, but with all that added size you're getting 20 hours of battery life and sound that will knock your socks off. It's not going to be the kind of speaker that you carry around in your backpack, but if you're looking for a great speaker to bring to the beach, or some other outdoor event, you can't go wrong.